New York, NY – November 26, 2018. Ron Gordon Watch Repair, New York City’s top OMEGA repair shop, is proud to announce a new blog post on the reissue of the OMEGA Seamaster. Announced by OMEGA at Baselworld 2018, the reissue of the OMEGA Seamaster 1948 has spawned intense interest in the luxury watch community and the watches are now coming available as of December, 2018, in limited quantities. The blog post explains the excitement behind the reissue, provides some of the back story, and has a link to the official announcement on the OMEGA site. To read the new blog post on the OMEGA Seamaster reissue, visit https://www.rongordonwatches.com/2018/11/omega-seamasters/. Those seeking OMEGA watch repair in New York City should visit https://www.rongordonwatches.com/omega-watch/ or call the Watch Repair Shop at 212-869-8999. Ron Gordon Watch Repair is conveniently located in Midtown Manhattan, NYC. Here is background on this release. Many people may not realize the important role OMEGA watches played in the British victory in World War II. 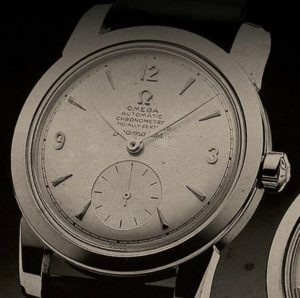 Between 1940 and 1945, for example, OMEGA delivered more than 100,000 timepieces to the British Ministry of Defense, and the watches were much favored due to their reliability, durability, and water resistance. The reissue by OMEGA draws attention to their historic role in the War and their role in the Peace as one of the first civilian watches to incorporate cutting-edge military technology. Some of the exciting features in the reissue are: a) Subdial at 6 O’clock, b) The Central Second Model, c) Commemorative Caseback, and d) Uniform Qualities. These are explained in the blog post and referenced from the official OMEGA announcement. Finally, only 1,948 of the watches will be released so fans are urged to start seeking them out, now. The next point in the blog post has to do with the intersection of personal history and watch history. Many New Yorkers may own a “vintage” OMEGA yet it may no longer be functioning in tip top shape. They may have it, sadly, stuck in a drawer somewhere. Or they may be planning to gift it to a young person this Holiday season. Regardless, they should be lucky to realize that New York City is home to Ron Gordon Watch Repair, one of the top OMEGA watch repair shops in the country. They’re urged to call in the watch repair shop and bring their watch in for an inspection and possible repair. The last thing one should do is to “gift” a non-functioning OMEGA watch!